I caught the blue hour. It makes such a dramatic photo. I tried to frame the table with the french doors. 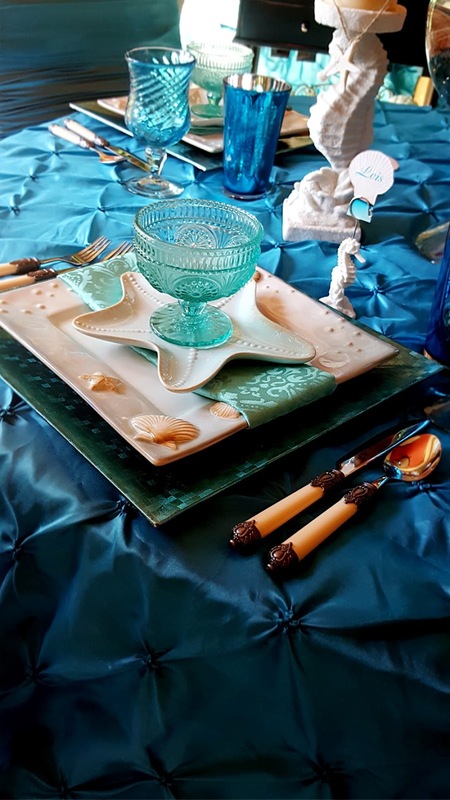 Starfish salad plates sit on top of the blue seashell dinner plates. Aqua goblets and aqua dessert compotes fit the color scheme. Notice the different place card holders? I used a large fishbow for the centerpiece and filled it the blue gems and seashells. A better look at the dishes here. 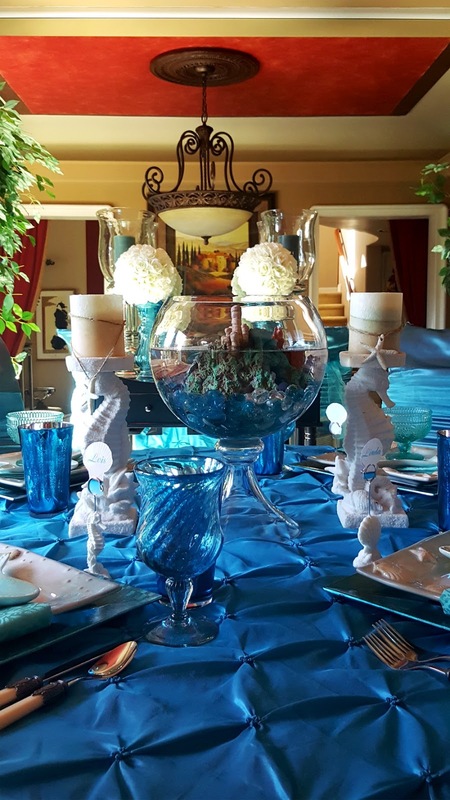 Seahorse candles holders fit this table nicely. The dessert cart is all decked out with aqua tall candle holders and rose balls. I hope your week is going great. 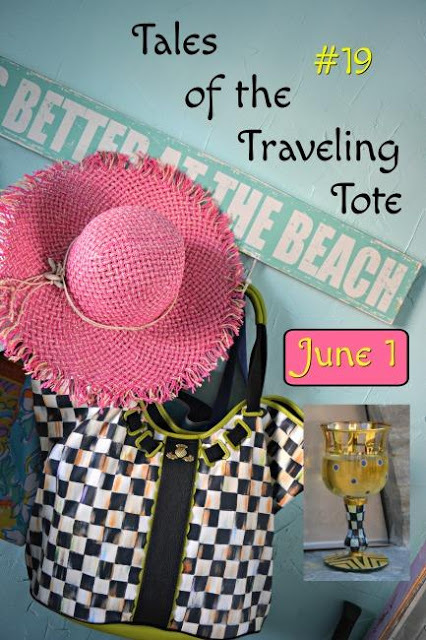 Make sure to link up to Dishing It & Digging it link party that started Sunday. Thank you. Wow Linda, aqua elegance in the blue hour! So pretty! 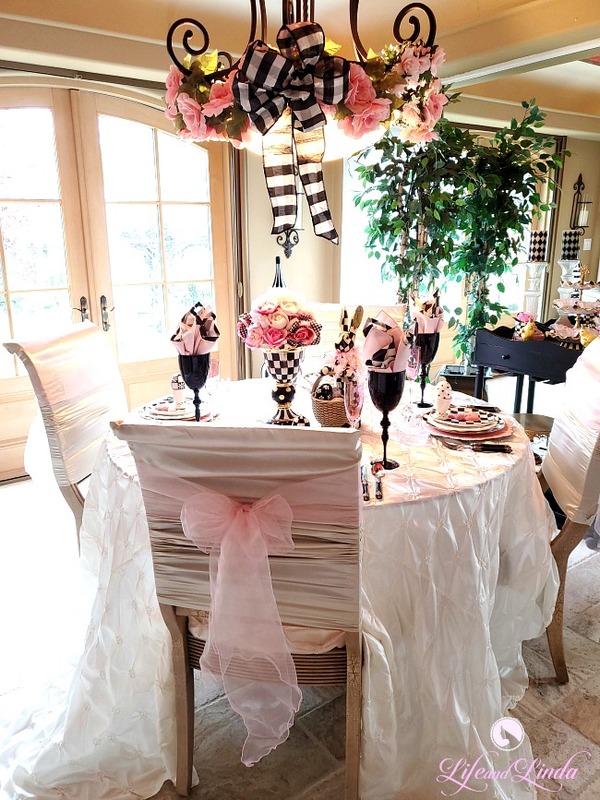 Love the tablecloth and how you framed the table with the French doors. The seashell candleholders are perfect as is all your dishware. Nice. The inspiration and colors are just perfect for summer. 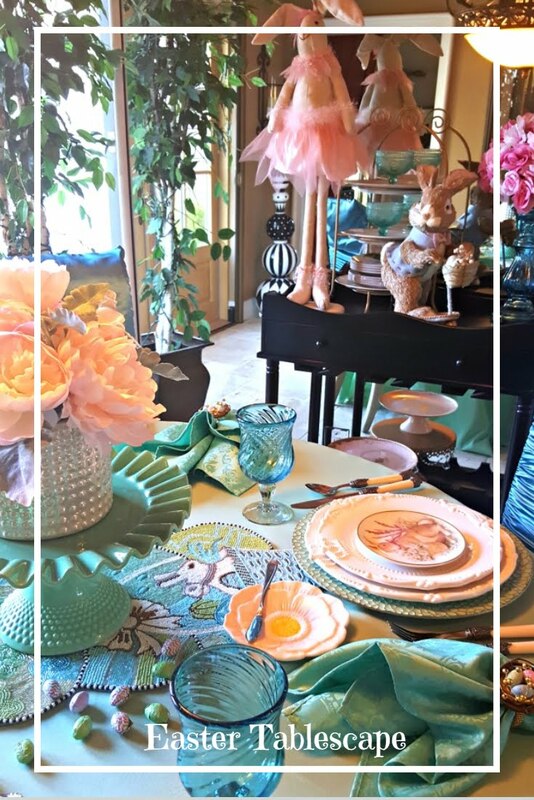 I love the colors in this tablescape. 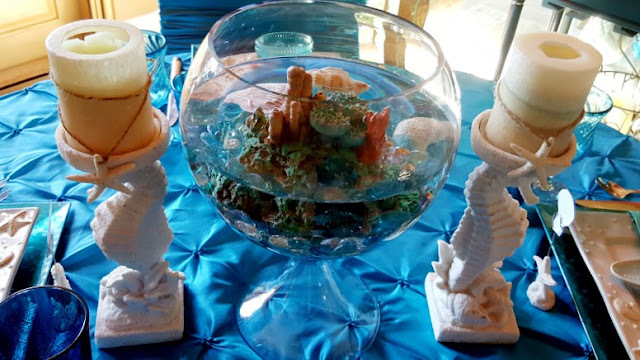 That centerpiece is awesome! Everything is soft and soothing. I've got a bunch of stuff lined up for a seaside tablescape but haven't put it together yet. Beautifully done! 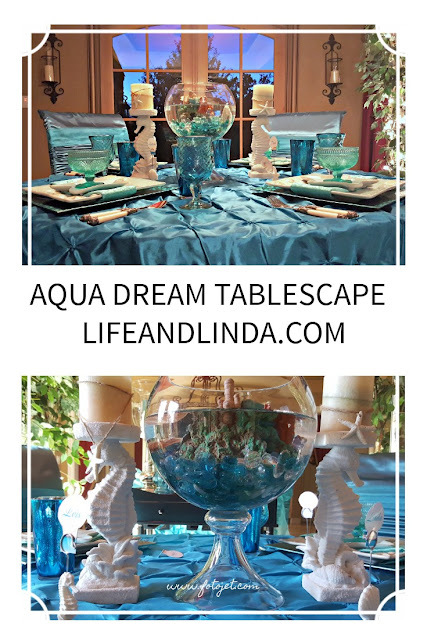 Linda, the aqua is so pretty in this tablescape. All of the accents work together beautifully! 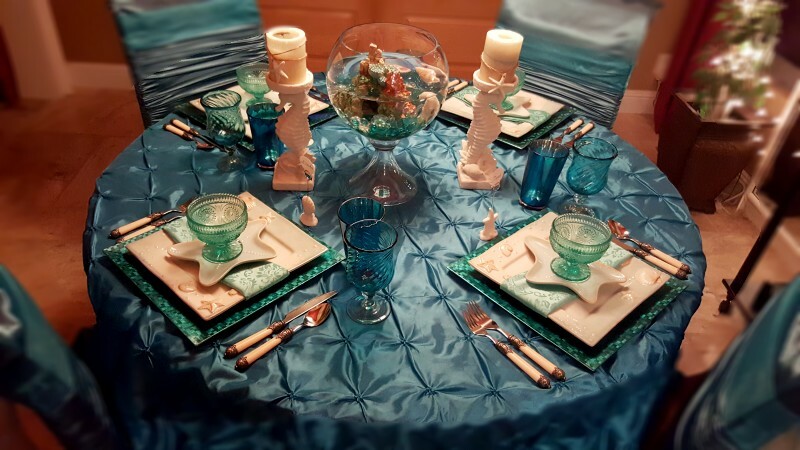 A wonderful table setting, dear Linda! 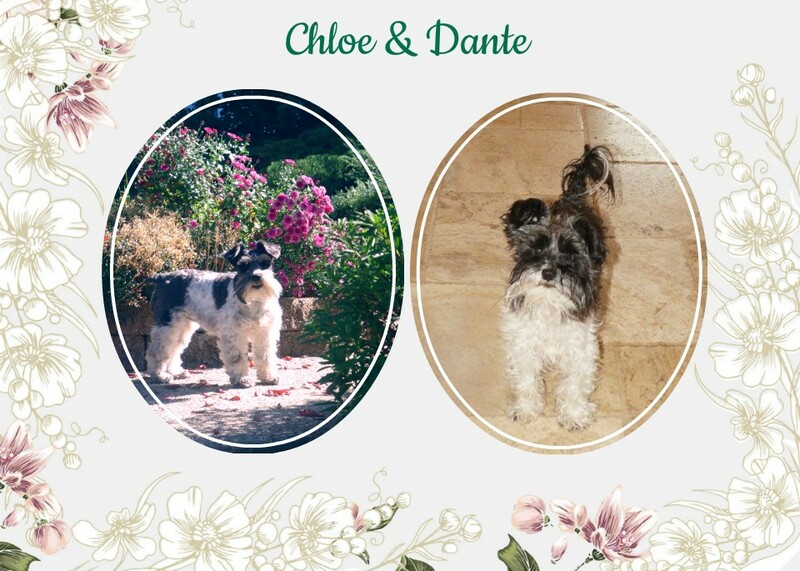 I just found your Blog by a Link at Celceste Marie, you did a beautiful new Blod gesign for her! 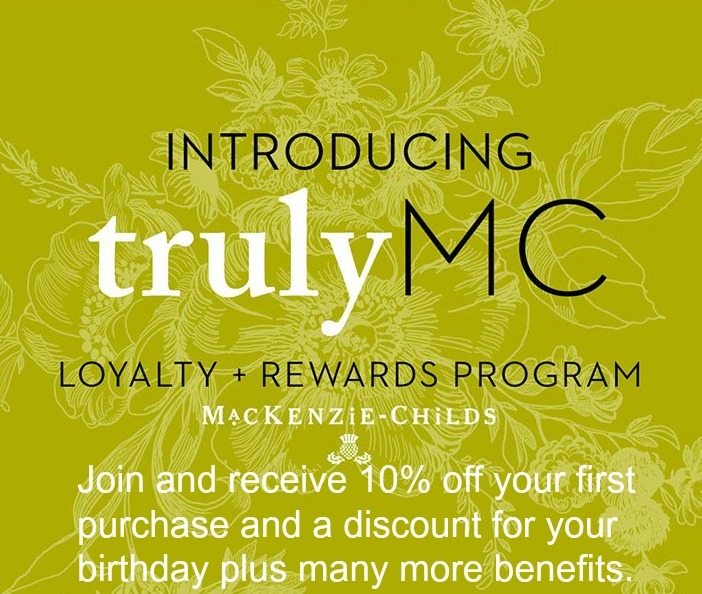 Wow this is so chic!!! All the beauty and drama of the sea. Love the tablecloth. Gorgeous! This has started the song in my head "By the sea, by the sea, by the beautiful sea . . . ."
Aqua reminds me of the sea, so I am "hooked"..... Nice!!!! Such a lovely table. I love those place card holders, so fun! Thank you so much for sharing at Celebrate Your Story! Oh Linda this is gorgeous. I love aqua this time of year. This is so inviting like time spent seaside!! Thank you for the inspiration. Hugs!! 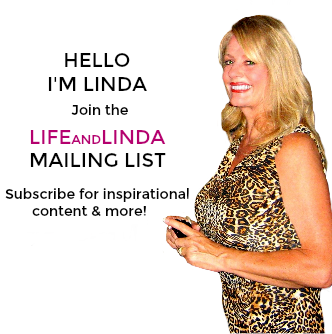 Love the color Linda, you have brought the ocean into our hearts and homes. Oh dear, well, blue is my favorite color and you CAUGHT IT RIGHT! How lovely your arched doors have allowed the blue night to enter! Every corner of your table is magic with this color of heaven and sea. LOVE! 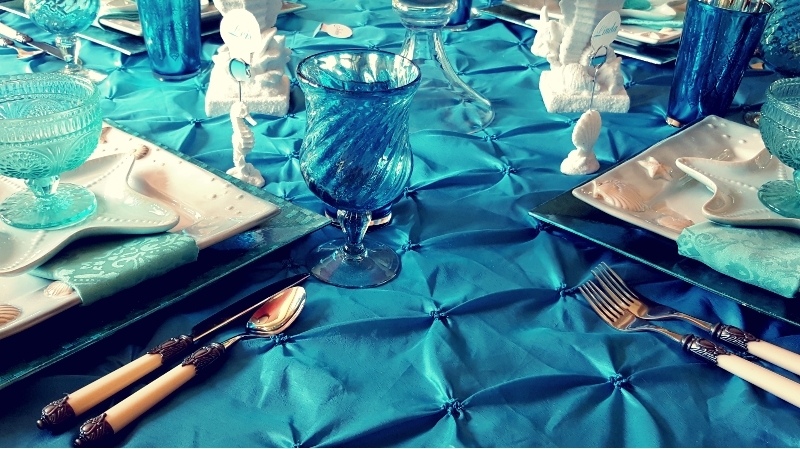 Love the blue hour and your tablecloth is beautiful! 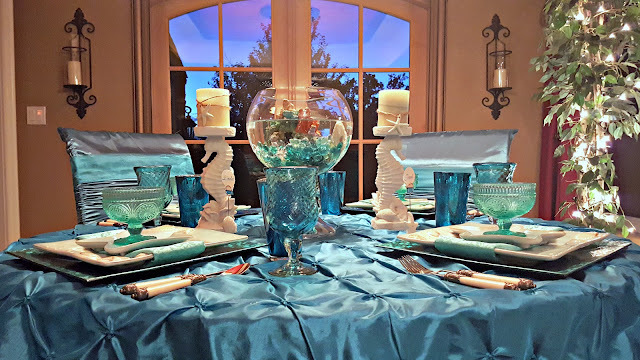 Love everything in your aqua dream tablescape. This is so chic and elegant. You know how much I adore your style! Wow Linda I love your gorgeous aqua table scape. It's just beautiful!!! So beautiful, Linda. It looks so enchanting with the aqua and "sea" theme. 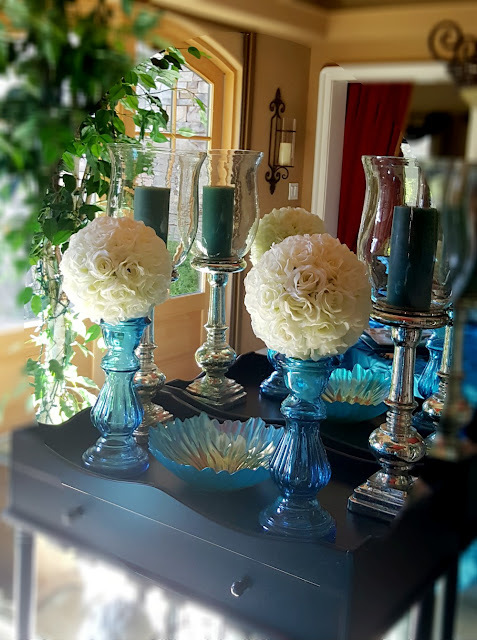 The candle holders and rose balls are soooooo pretty. One of my favorite colors for sure. Wow, Linda, if you hadn't said you caught the blue hour I would have assumed that was photoshopped, lol. Such a fantastic capture!! Love your table and it makes me want to sit down with a glass of wine and get lost in the ambiance! The view outside your doors is stunning! Your table is beautiful and I especially love the creative use of the water filled bowl in the center. 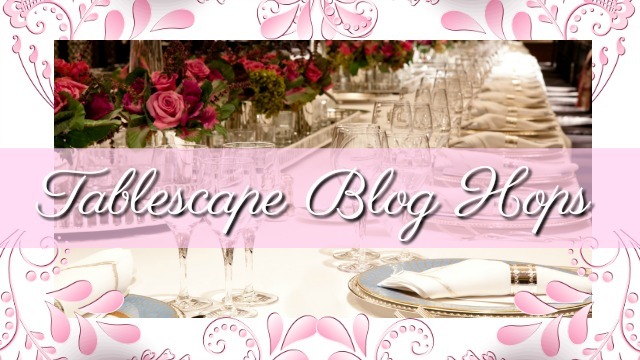 Your tablescape is beyond gorgeous, Linda! I love all shades of aqua or turquoise (we all call it whatever it means to each of us), but I don't think I've ever seen it used so beautifully. One of my favorite colors. So pretty. You are clever.